With David Ortiz retirement in full swing, the Red Sox and Yankees will square off for the first time without the final piece of the once great rivalry not present. Whether it was Roger Clemens buzzing a 97 MPH fastball behind Manny's head, Pedro Martinez tossing Don Zimmer to the ground or Jason Varitek beating up Alex Rodriguez, every Red Sox and Yankee fan can look back and remember those series where there were guys getting plunked and benches were constantly clearing. 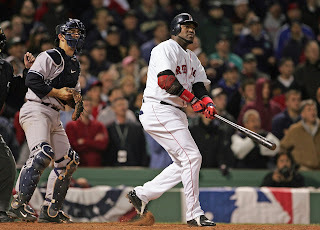 With Ortiz gone, Yankee fans can take a deep breath now that # 34 isn't striding up to the plate verse them four times a game, however, they should also be sad because the final piece of that great early 2000's rivalry has said his goodbye to baseball just like the other greats that were apart of the rivalry, as well. You can make the argument that the game has changed (which it definitely has since the early 2000's), you could make an argument that the players don't treat the rivalry with as much hatred as they did back then or you can say both teams haven't been contenders in the same season like they always used to. Which ever way you feel about it, we can all agree that this rivalry that was once bloody and filled with hate is now considered 'just another game' amongst the players. There will always be that rivalry between the fans because of that Boston-New York hatred that's been around forever, however, it is now up to the young players apart of the Red Sox and Yankees, who grew up watching just like all of us, to keep this rivalry going and get it back to what it used to. Maybe it will take another playoff series to get the rivalry back to what it was since the two haven't met since Boston's remarkable comeback after being down 3-0 or maybe it will take Chris Sale plunking a Yankee hitter and staring him down as he walks down the line. Whatever it may be, Boston and New York can agree on probably one thing and one thing only and that is to get this rivalry back to what it should be like.